The meteorologists at MeteoSchweiz are a cheerful lot. Their forecasts are pretty reliable on the whole, although there is a hang to hysterics when issuing warnings of thunderstorms, downpours or blizzards. But to be fair, this is probably more a fear of lawyers than of lightning. They also run a blog, a blog that is usually as cheerful as themselves, very well written and full of useful knowledge: timing of cuckoos, weather folklore, odd-shaped clouds and other curiosities and the essential facts about lapse rates that everyone should know. We get photos of apple blossom, foggy meadows and sparkly mountains. Switzerland – God's own country! Some time ago they acquired a new member of staff, Mr Climate, who brought with him large sacks of money and a new supercomputer. He's not a very sociable chap: while his colleagues are standing at the window listening for cuckoos and taking bets on precisely when the rain will stop, he's muttering doom at the cactus on his desk. He's haggard, drinks only fairtrade coffee and lunches off dried insects. In his youth he used to be quite fun, but once he drank the viscous green liquid offered to him by those éminences grises of climatology in Switzerland, Professors Knutti and Stocker, he changed dramatically, becoming wild, rambling and completely detached from reality. Yes, that's him. 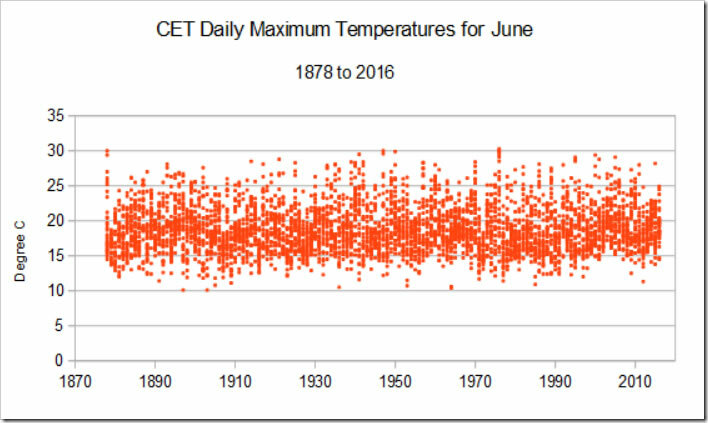 Normally it's best to just move on and read something else, but you may be curious to find out how Mr Climate has pulled off the greatest scientific coup in the history of climatology since Michael Mann's hockey stick and confirmed the influence of CAGW on a June heatwave. OK, let's read on. What? If that is true, from where does he get the certitude of the title, then? 'Confirmed'? Let's read on. Yada, yada, yada… models… yada… models… yada… 'World Weather Attribution'. Oh, right – them. In other words, Climate Central, one of the most insidious purveyors of warmist propaganda and fake science currently in existence. Mr Climate even translates and reproduces material from WWA's 'analysis', all based on completely discredited IPCC model forecasts: Figure 7: Probability for mean June temperature in the period 2070-2099 to exceed the maximum mean June temperature of a reference period’s climate (here 1981-2010). Left panel: RCP4.5, right panel: RCP8.5. Shown are ensemble mean probabilities as provided by bias-adjusted EURO-CORDEX regional climate scenarios. Image: Metoschweiz/WWA. Why has weather forecasting become infested with rabid climate change advocacy? People who will say anything as long as it gives the reader a fright? Money. In order to keep that money flowing it appears that every weather phenomenon now has to be interpreted according to climate change orthodoxy. MeteoSchweiz now issues monthly climate reports. The cuckoos have taken over the weather offices. ^ Ist nun der Klimawandel „verantwortlich“ für die Juni-Hitze? Ein klares Ja oder Nein als Antwort ist nicht möglich. What about some real data? Not Switzerland, but Britain. However much you stare at the chart, a global warming signal is not to be seen. According to theory, AGW should have become noticeable from about 1950 onwards.